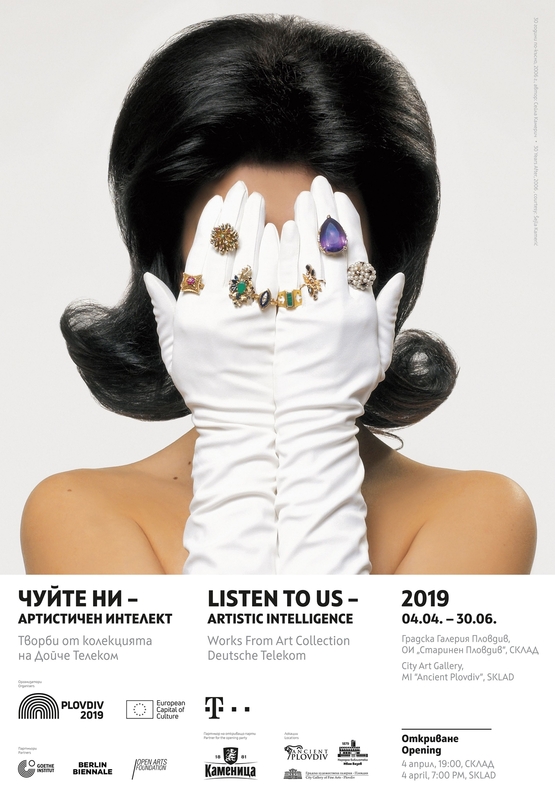 An exhibition entitled “Listen to us – Artistic intelligence”, of works by more than 40 artists who grew up in Eastern European countries, is being held in galleries and venues in Bulgaria’s second city Plovdiv from April 4 to June 30 2019. The opening is at the Sklad venue at 16 Exarch Yosif Street in Plovdiv on April 4 at 7pm, and aprrt from Sklad, works are being shown at Plovdiv’s City Art Gallery, Balabanov House, Hindlyan House, Zlato Boyadzhiev Gallery and the Ivan Vazov National Library. The works, from the Art Collection Deutsche Telekom, are curated by Nathalie Hoyos, Rainald Schumacher, with Dimitrina Petrova as co-ordinator. The fall of the Iron Curtain some 30 years ago laid the foundation to overcome the decades-long division of Europe into East and West, into capitalism or communism, into democracy or party dictatorship. The more than 80 works in the exhibition have been created during these 30 years, the statement said. They are from over 40 artists who grew up in Eastern European countries. “These artists have experienced the process of the societal upheaval in their own biography and in that of their parents and grandparents. The works in the exhibition art draw attention beyond the past to current issues and questions that affect us all in Europe, the statement said. The participating artists are Nevin Aladağ, Anatoly Belov, Luchezar Boyadjiev, Yane Calovski, Levan Chelidze, Danika Dakić, Braco Dimitrijević, Aleksandra Domanović, Petra Feriancova, Igor Grubić, Aneta Grzeszykowska, Nilbar Güreş, Vladimir Houdek, Hristina Ivanoska, Pravdoliub Ivanov, Sanja Iveković, Nikita Kadan, Mi Kafchin, Šejla Kameric, Lito Kattou, Luka Kedžo, Genti Korini, Eva Kot’átková, Maria Kulikovska, Nino Kvrivishvili, Radenko Milak, Ciprian Mureşan, Lada Nakonechna, Vlad Nancă, Paulina Ołowska, Roman Ondak, Dan Perjovschi, Cristian Răduţă, Stepan Ryabchenko, Slavs & Tatars, Nedko Solakov, Mladen Stilinović and Martina Vacheva. The invited artists are Dimitar Genchev, Albena Mihaylova-Benji, Sasho Stoitzov and Krassimir Terziev.